A solution is being applied to copper panels to accelerate patination (aging process for copper). Learn more about metal roofs with our helpful infographic, here! A solution is being applied to copper panels to accelerate patination (aging process for copper). Not enough time has elapsed to really bring out the patina in this video. However, in part two of this video, after more time passed by, much more patina develops. The most friendly Miami roofing contractor professionally details the installation of the metal panels step by step. Have questions about metal roofs? We answered the most popular questions with this helpful infographic! The most respected roofing contractor in Miami, Istueta Roofing presents a video detailing the German-made Rhenizink metal panels. The video also discusses the applications of the panels with respect to the GRACE Ultra underlayment, J-Channel and gutters. Check out another video from the most trusted Miami roofing contractors about metal panel installation specializing on roof panel securing. This video demonstrates how the most professional roofing contractor in Miami expertly installs properly seamed panels and the ongoing installation of white metal panel roofs. In this video Joe describes the installation of this beautiful white metal roof in Pinecrest, FL. Riffe metal roofs are known as some of the highest quality metal roofs in the market. They provide high end results that have been rigorously tested. Properly installed high quality metal roofs have high wind & weather resistance. Riffe metal roofs offer you ultra high performance and beauty & simplicity that blends nicely with your home. Learn more about standing seams on our blog, here. In this video Frank shows us how the Rheinzink metal flashing is going to be properly installed for a new house in Miami Beach. In the video, Frank goes step by step on how the Rheinzink is going to be properly installed with the J-channel and the stucco-stop applied to the metal roof by the most trusted roofing company in Miami, FL. This instructional video shows the preparations for the 1st house in Miami to have its roof installed with Rheinzink Metal. The preparations done by the most qualified miami roofing company include waterproofing, Grace Ultra underlayment and J Channel two weeks before installation. This video was made at the Istueta Roofing warehouse in Miami. Our carpenters are properly sanding and preparing fascia boards for a new metal roof project. Istueta Roofing provides the best experience for our clients and we take pride in our craftsmanship. This is why our clients have continually, for 26 years, told us and their families and friends that Istueta Roofing is the most qualified and professional roofing contractor in Miami, FL. This video demonstrates how this roof in Coconut Grove was flawed in it’s previous installation by an unqualified contractor and what Istueta Roofing, the best roofing contractor in Miami, FL, plans to do to properly replace this roof. Want to learn more about up-keep for your metal roof? Check out our helpful tips on our blog. This video demonstrates how Istueta Roofing, the most qualified roofing contractor in Miami, FL, plans to properly replace this roof. Access to the roof was difficult for this project and Istueta Roofing demonstrates how to properly and safely access a roof without damaging the landscape. The most professional roofing contractors in Miami, FL also explain how they will protect the client’s home during installation. This most trusted roofing contractor in Miami, FL demonstrates how a metal roof panel is properly nailed down to protect you and your home. Have questions about metal roofing? Learn more about metal roofs on our blog! The most qualified roofing contractor in Miami, FL, describes how the process of replacing and re-nailing a wood deck is properly done. This roof was previously a tile roof and the homeowners decided to convert to a metal roof. This video shows metal panel forming machine in Miami, FL, Coconut Grove. This video continues to explain the details of the new metal roof in Miami, FL, Coconut Grove and how proud we are of the craftsmanship the production crew exhibited. This video explains the details of the new metal roof in Miami, FL, Coconut Grove and how proud we are of the craftsmanship the production crew exhibited. This is a video of a metal roof in Miami, FL during installation. The roof was previously clay tile and the homeowner decided a roof that would last their lifetime and best protect them from severe weather is the best option for their family. In this instructional video, Alex, one of our most highly skilled installers, demonstrates how a curved copper roof panel is properly installed onto a roof. He displays the high quality craftsmanship of the most qualified roofing contractors in Miami, FL. Alex makes sure our clients receive the best product possible and this is part of why our clients consider us the best qualified roofing company in Miami. This video gives us a look into how metal roofing panels are formed while on site by the most trusted roofing company in Miami. This video of a new metal roof installation in Pinecrest, Miami, FL, shows how a metal roof is properly reinforced and how a metal roof is properly installed courtesy of the most qualified roofing contractors in Miami. Looking for more information about how to maintain a metal roof? Discover more on our blog, today. Frank takes some video of on-site metal forming in progress. This is a metal roofing project we have just started and it’s looking great already! Metal roof panels being formed on site by a metal roll forming machine. 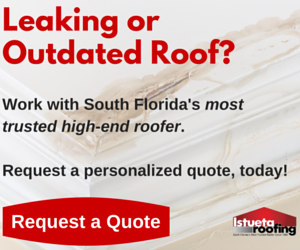 If you’re ready to start work on your roof, request a customized quote from South Florida’s most trusted roofer, Istueta Roofing! Simply click the button below to request your quote, now.